VERNON, Calif., Aug. 31, 2016 /PRNewswire/ — Americans regard vegetable oils as the “healthiest option” for cooking and frying, but a majority are unaware of the health risks arising from the manufacture of products like canola oil and palm oil, a new consumer survey from Coast Packing Company and Ipsos Research reveals. The nationwide poll of 1,000 adults, conducted in August, examined both awareness and behavior around vegetable oils and how they are processed and packaged, querying consumers about what they read, understand and believe – and how they act, based on that information. When asked “which one of the following cooking/ frying oils do you think is the healthiest option?” 51 percent named canola oil, followed by butter at 11 percent, corn oil at 9 percent, palm oil at 8 percent, beef tallow at 2 percent and lard, also at 2 percent. Another 18 percent said they didn’t know. Vegetable oils are highly refined, a process that enlists chemicals to extract the oil from the seed — including compounds like n-Hexane, a known neurotoxin that has found its way into the food chain, where residuals have been detected. The system used to refine vegetable oils also produces “process contaminants.” These substances form during food processing — in particular, when refining vegetable oils at high temperatures. Recent studies have indicated that the extraction processes used in producing vegetable oils for cooking/frying foods can release various potentially unhealthy toxic agents. Survey respondents were asked to rate their awareness of the potential health risks associated with consuming vegetable oils on a 1 to 5 scale. 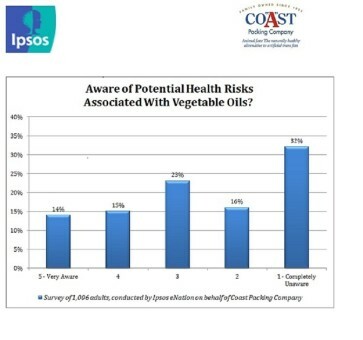 According to the Coast/Ipsos research, roughly half of those surveyed indicated little or no awareness of potential health risks arising from vegetable oil processing. Overall, 48 percent were unaware, 29 percent indicated they were “very aware” or somewhat aware and another 23 percent were in the middle. Millennials, men, residents of the Western states, respondents with children at home, those better educated and those employed all recorded a higher overall awareness of potential health risks. In May, the European Food Safety Authority (EFSA), which is responsible for conducting risk analysis on the safety of food in the European Union, released its findings concerning public health risks from the intake of process contaminants called glycidyl fatty acid esters (GE), 3-monochloropropanediol (3-MCPD), and 2-monochloropropanediol (2-MCPD) esters. The EFSA found “sufficient evidence” that glycidyl is genotoxic – damaging genetic information within a cell, triggering mutations and potentially leading to cancer — while the toxicity in 3-MCPD and 2-MCPD is organ-specific. The highest levels of GE, 3-MCPD and 2-MCPD were found in palm oils and palm fats, followed by other oils and fats. Intake in children under 18 — and particularly infants — was characterized as a possible health concern. “Squeezing oil fit for human consumption from seeds is complex and anything but natural,” said Eric R. Gustafson, CEO, Coast Packing Company, the number one supplier of animal fat shortenings in the Western United States. “The science is increasingly clear. With toxic additives and carcinogenic compounds putting popular vegetable oils at risk, embracing minimally processed animal fats isn’t a fad. The Coast Packing/Ipsos study was fielded in August 2016. Ipsos eNation surveys consist of a minimum of 1,000 completes with adults 18 years of age or older in the contiguous United States. The sample includes individuals selected from the online segment of Ipsos’ iSay/Ampario Panel, and is balanced to be representative of the general population based upon region, gender, age, and household income data from the U.S. Census Bureau. Results have a margin of error of +/- 3 percentage points. For a copy of the survey results, please email admin@edgecommunicationsinc.com. Ipsos is a global independent market research company ranking third worldwide among research firms. The Ipsos team is passionately curious about people, markets, brands and society. Ipsos makes our changing world easier and faster to navigate, and inspires clients to make smarter decisions. The company delivers research with security, speed, simplicity and substance. Ipsos is one of the world’s largest independent market research companies, and in 2015 it celebrated its 40th anniversary. For more information about Coast Packing Company, visit: coastpacking.com. Follow us via social media on Facebook, Twitter and Pinterest. Coast Packing Company (coastpacking.com), a closely held corporation, is the number one supplier of animal fat shortenings – particularly lard and beef tallow — in the Western United States. The company sells to major manufacturers, distributors, retailers, smaller food service operations, leading bakeries and lesser concerns. The company participates actively in various ethnic markets – from Hispanic retail chains, with its VIVA brand, to various Asian specialty markets. Based in Vernon, Calif., Coast Packing Company is regional, national and, increasingly, global. In some cases, supplier relationships are multigenerational, extending back 50 years and more.